This week we present to you our latest 3D printing filament, the PETG-S OWA, part of our recycled and recyclable range. If offers very similar properties to the PETG Carbon, as it is a polyethylene terephtalate with added glycol. The special feature of the PETG-S is the fact that it has been biosourced, in addition to its variety of colours enabling brighter, and even polychrome, objects to be printed. PETG is an amorphous plastic that offers multiple interesting properties, including good chemical resistance, dimensional stability and impact resistance, the latter being achieved through the addition of glycol to reduce the brittleness of classic PET. It is also suitable for food contact applications, enabling users to print cooking moulds and other utensils. As it can be sterilised, it is also highly valued in the medical sector, notably among pharmaceuticals laboratories. 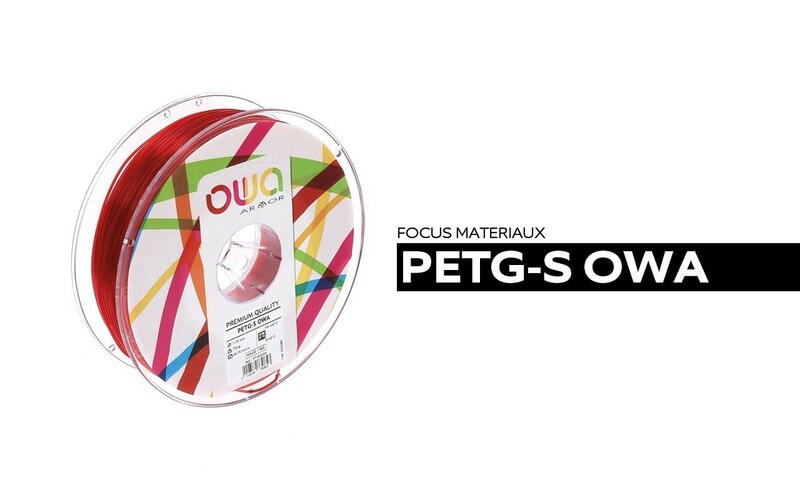 The PETG-S is rooted in the OWA philosophy: it is a biosourced filament obtained from the collection service we have been operating for many years now. It is sourced from recycled printing waste and is therefore also recyclable. It is ideal for an approach based on the circular economy that reduces waste, just like our PS OWA and PLA-HI. This filament offers an excellent balance between flexibility and mechanical resistance and is not sensitive to humidity, offering good inter-layer adhesion. Lastly, new reel colours are also available. The PETG-S is being produced by Armor 3D in 3 new colours, with red, green, black and yellow, all of them translucent. Just what you need to produce original and unique items, whatever your printing profile! The printing parameters are unique to each 3D printer, we therefore recommend that you carry out a few tests to find the most suitable. However, don’t hesitate to contact our sales team if you need any assistance in selecting the right filament!